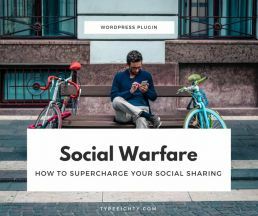 When I first started my website, I remember spending hours trying out different social sharing plugins before I decided to use Social Warfare. Do you use any social sharing plugins on your website or blog? 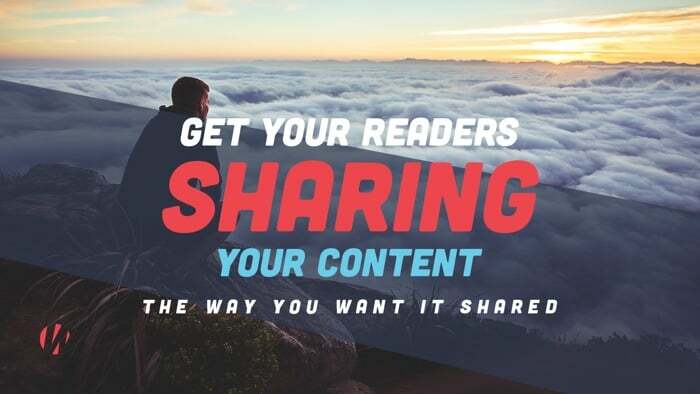 Do you make it easy for your users to share your content? 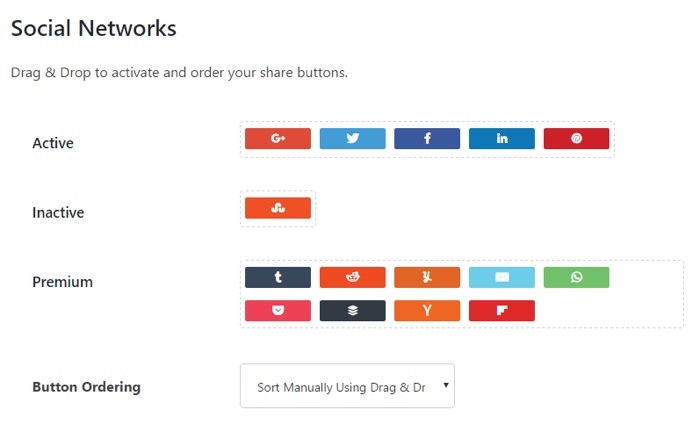 Or are you wondering how to add social share buttons to your blog posts? I tried out a couple of social sharing plugins such as Sumo and Easy Social Share Buttons for WordPress. None of them really gave me the right feels and I ended up uninstalling the plugin due to various reasons. Some of these plugins have a bad or outdated design, limited features, and the worst thing, it slows down my site. However, once I installed Social Warfare plugin, I stopped looking at other social sharing plugins. Social Warfare’s nice and clean design fits my website right away and most importantly, it’s lightning fast and doesn’t slow down my website at all. But it’s not all there is to it. In this post, I will walk you through all the features that make Social Warfare the best social sharing plugin. Social Warfare is the best social sharing plugin in the market, hands down. It is lightning fast and won’t slow your website down at all. Social Warfare is easy to configure. You have full control over your social shares on ‘per network’ basis. You can also configure and change social settings for each post. Social Warfare is a freemium social sharing plugin. While the free version gives tons of features to get started with, the pro version will supercharge your social sharing. Slow loading website is the most reason why your visitors leave your website. How many times did you wait for a page to load and decided to close it because it took a long time to load? First of all, Social Warfare doesn’t slow down your website at all. I’ve tried other social sharing plugins previously that I uninstalled right away because it slows down my website. On the other hand, Social Warfare is lightweight and it uses automatic caching and smart updating to load quickly on almost any device or connection. Social Warfare supports 15 social networks and apps including Facebook, Twitter, Pinterest, Whatsapp, Flipboard, and more. It’s very easy to drag-and-drop these buttons to activate or deactivate them. You could sort the buttons manually or dynamically by the number of shares. How many social sharing buttons should you use on your website? Social Warfare recommends 3 – 5 buttons max. You should only display top sites that generate the best number of shares for your audience. There is an interesting article on the paradox of choice where more options always lead to fewer actions. And conversely, fewer options always lead to more actions. The study shows that adding more social sharing buttons to your site won’t generate more shares. 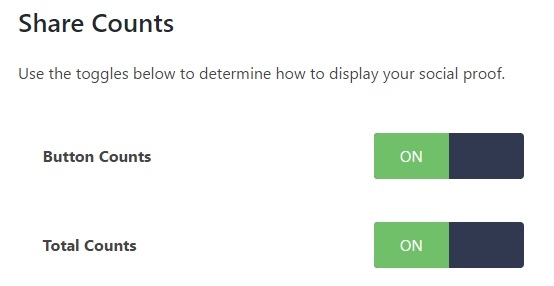 You can choose to display the total number of shares or display share counts on each button. It’s very easy to toggle between these 2 options. Not only this, you can also set a minimum number of counts before displaying it on your website. I find this option extremely useful as you can show the share counts automatically once it hits the minimum amount. 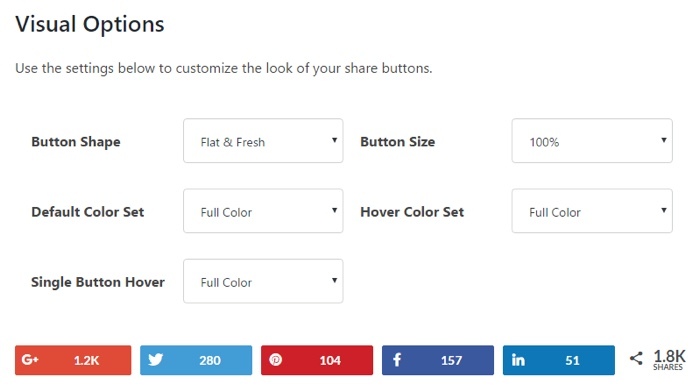 Don’t display social sharing buttons with 0 counts, it will hurt your conversion rate. This applies to eCommerce as well. 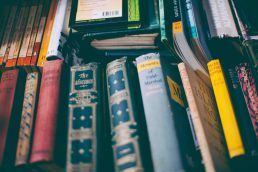 Check out this interesting case study from VWO on how they managed to improve conversion by removing social sharing buttons. By removing social sharing buttons that had low counts, they improved conversion rate by 11.9 percent. The visual option is the first thing that drove me towards using Social Warfare. All the social sharing buttons are beautifully designed. In addition to that, there is more than 5,000+ design option combination you can choose from. Social Warfare supports 4 different locations for the social sharing buttons. You can have them displayed above the content, below the content, above and below the content, or none. With this setting, it’s easy for you to change the display position of the social sharing buttons for each post types. Most bloggers are displaying social sharing buttons before or after the content. While that’s the standard way of display social sharing buttons, it’s not making it easy for your visitors to share your content. You’ll be expecting your visitors to scroll all the way down or top to find those buttons. Floating buttons change the way your visitors share your content. At any point in time, they are reading your content, they can always share it right away. I found this feature extremely useful to increase my conversion rate. Before using Social Warfare, I have to install another plugin separately just to achieve the same functionality. With Social Warfare, it’s one less plugin to install. 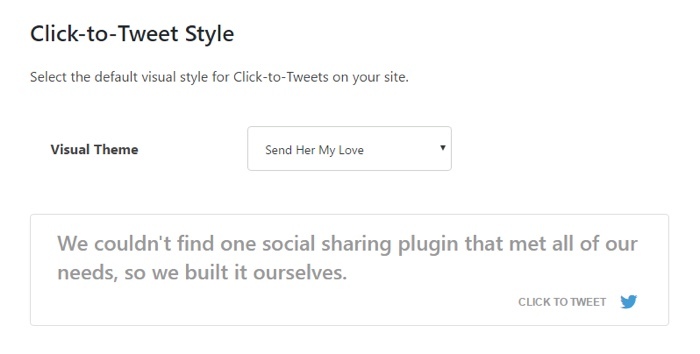 Click To Tweet makes it easy for your visitors to share your content. You can create a tweetable quote anywhere in your content. There are 6 different themes you can choose from. With their recent update, Social Warfare is beefing up their Pinterest sharing capabilities to help you grow your Pinterest traffic. Do you feel annoyed when you click on the Pinterest sharing button on your post and it shows all the images that page? You can avoid that with Social Warfare’s Advanced Pinterest feature. Not only that you can also choose to hide the Pinterest specific image from your post. Which is great! I am not a fan of inserting a huge Pinterest image in a blog post. The other feature worth mentioning is the Image Hover Pin Buttons. With this feature on, you can force the Pin It button to share the Custom Pinterest Image and its description rather than the image is being hovered over. With Social Warfare, you can make sure that your visitors are sharing your Pinterest-optimized images which will encourage more pins and increase your traffic. Another cool feature that comes in Pro version is the Popular Posts Widget. You can drop this widget on your blog’s sidebar or footer and it will display your most popular blog posts by how many social shares they’ve received. You can choose which specific network to base your post’s popularity on. You can choose to enable the Twitter Card. If you are using Bit.Ly to shorten links on your tweets, you can activate this feature and connect your Bit.Ly account. I don’t personally use this feature but still, it’s a good addition to have. This is another cool feature that would help you in the long run if you’re not using SSL yet on your blog. One of the biggest issues that bloggers faced after installing SSL cert on their blog is that their social share count reset back to zero. It’s definitely daunting to lose those social share counts you worked so hard to built. Social Warfare can help you recover share counts from previous permalink structures, when moving to/from a subdomain or when switching to HTTPS. So if you’re using Social Warfare, don’t worry your social share count when you install your SSL. Content hijacking is a nightmare for every site owners. Imagine seeing your content being used by other people or websites to promote their own ads or call-to-action buttons. It’s frustrating but it’s happening and most people might not realize it. Tools like Start a Fire and Sniply make it even easier for people to hijack other people’s content by loading content in a frame. Luckily, Social Warfare comes with built-in Frame Buster that will detect if your content is loaded in a frame and redirect users to your website. The Frame Buster will disable frame shares from apps like Sniply and Start A Fire. How Much Does Social Warfare Cost? There is a free version of Social Warfare that you could download here. Lieutenant’s Package ($29/year): Allows you to activate Social Warfare on 1 website. Captain’s Package ($135/year): Allows you to activate Social Warfare on 5 websites. Colonel’s Package ($250/year): Allows you to activate Social Warfare on 10 websites. Once I installed Social Warfare on my blog, I stopped looking at other social sharing plugins. I like the beautiful visuals and the simple controls that comes with Social Warfare and not to mention, Social Warfare doesn’t slow down my site at all. As you know, page loading time affect your page views and the more plugins you installed will add on to your page load time. Installing Social Warfare also eliminates the need to install another plugin such as Click To Tweet, Frame Buster, Pinterest, and more. So, should you get Social Warfare? 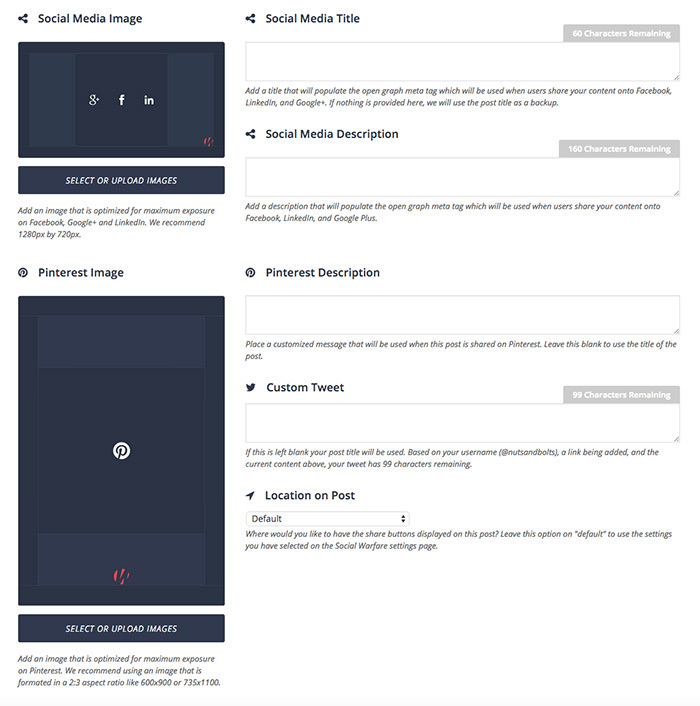 If you feel like your current social sharing plugin in slowing down your site, you should get Social Warfare. If you feel like your social sharing count is not growing and you’re feeling stuck, you should get Social Warfare. Another thing I like about Social Warfare is that they are built by professionals with a huge interest in social media marketing. 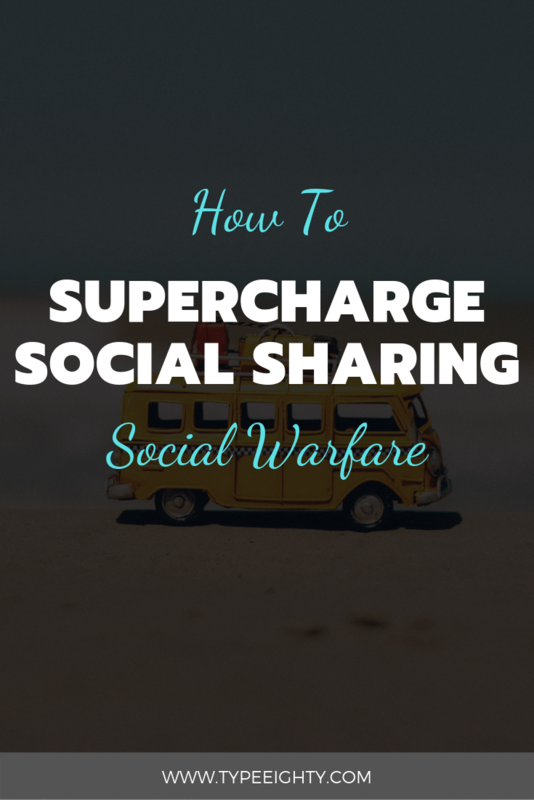 You should check out their blog to get the most out of Social Warfare to supercharge your social sharing. Nice information. Will definitely try this. Looks very clean and light weight. Thanks for sharing. Good job..
Social media can be a major traffic for certain blogs and it works differently for different niches. Knowing how you can maximize your existing social media to drive traffic to your blog is important. 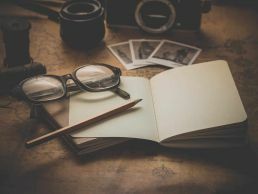 Hope it helps you in growing your blog. Thanks for this post! I appreciate having feedback and screenshots that show all the options before you commit to buying a plugin. Buying a plugin is an investment no matter how expensive or cheap it is. Hope it helps you in making a decision before committing to it. Feel free to let me know if you need any help with it. Thanks for the kind words, Kiyashmi. 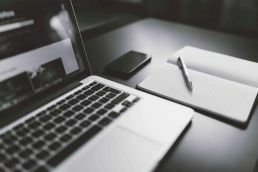 It’s great to hear this post helps you to set up the plugin on your blog. Social Warfare is a powerful plugin, do check out their blog to make full use of its features. Social Warfare works really well! I love how customizable it is. It really is. It’s one of the easiest yet useful plugin to have. I love that you included the TED talk on the paradox of choice. More choices/buttons are not always better! I hope that open up a new perspective onto it. I ended up reducing the number of social networks I am using and I see some improvements in certain posts.